Today’s warfighter must have the tactical edge when if comes to authentication and communications. Making data driven decisions and mission speed is mission critical. CybrSec b² cryptography, allows a warfighter to be securely authenticated and send/receive hardware based, AES 256-bit encrypted, phone calls, text messages, email, and access to data all over private or hostile public networks without compromise. This secure level of authentication and communications can be provided with commercially available devices or military hardened devices. This dynamic eco-system provides a secure connection, between the warfighter and command. The Warfighter Authentication and Secure Communication system has been developed in response to the need identified by the Department of Defense for a coordinated enterprise-level approach to cloud infrastructure to make it possible for warfighters and leaders to be able to make critical data-driven decisions at “mission-speed”. A most critical factor for consideration during the expansion to a coordinated system is Information Security. While the coordinated approach provides critical capabilities, data breaches are potentially more substantial and therefore more catastrophic. The evolution to a coordinated approach can only be contemplated in the context of the deployment of better security methods and technology. The Warfigher Authentication and Secure Communication System provides an integrated security solution that utilizes b² cryptography, a next-gen, award-winning security technology designed to perform in the severe and mission critical environment of the battlefield. The major breakthrough in b² cryptography is the ability to remotely, and securely exchange encryption keys. This enables both authentication of a verifiable identity and secure communications even over a public hostile network. The WASC system provides the ability to identify the warfighter, and give access to CybrSec Secure Services. These services include secure communications, such as email, phone calls, text messaging, and video calls. These communications are extremely secure and can be sent over public networks using commercially available devices without compromise. 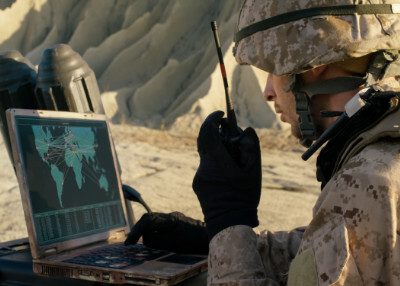 Warfighters also have access to CybrSec Secure Vaults where they can access encrypted data, such as battlefield intelligence, from any location while connected to any network. If the data that is secured with b² cryptography were to be captured and examined through deep packet analysis, the data would be useless to the viewer. The WASC solution offered by CybrSec provides important benefits to the Department of Defense (DoD). 1) It is the only hardware-based security system to provide intrinsic authentication. It eliminates man-in-the-middle (MITM) attacks. 2) Can be used to remotely manage security credentials based on a chain-of-command hierarchy. 3) Makes email, text, telephone and video communications extremely secure even over public networks when necessary. 4) Deploys on top of existing security methods and solutions. 5) Protects sensitive data in servers even when captured in the field by insurgents. 6) Utilizes nano-latency networking technologies developed under SBIR Army Contract # W31P4Q-12-C-0118, improving network response times by orders of magnitude making it possible for warfighters and leaders to be able to make critical data-driven decisions at “mission-speed”. 7) Provides the ability to make sensitive data available in the battlefield, while restricting the data decryption capability upon demand from central command. CybrSec b² cryptography is the cryptographic technology behind the 2018 Defense Innovation Award winning “Warfighter Authentication and Secure Communication” (WASC) system. 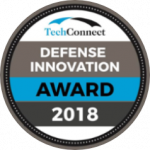 The Defense Innovation award recognizes disruptive technologies and the impact they can have when it comes to our national security and the warfighter. b² cryptography utilizes portable GoldKey® security tokens that are connected in a hierarchical structure. While these tokens have a familiar form-factor, don’t be fooled. Tokens that are powered by b² cryptography are orders of magnitude stronger than smart cards or other tokens. The WASC hierarchical structure provides a five-tier chain-of-command deployment, allowing authority to be delegated from the Commander-in-Chief all the way down to the war-fighter, all based on the National Command Authority organizational structure. A user’s authority can be readily allocated or revoked by any user higher in the chain-of-command. The encryption keys distributed throughout an organization are all managed and stored securely inside the FIPS 140-2 validated GoldKey token hardware and are never in an exposed or vulnerable state. Once the hierarchy structure is in place, military-grade AES 256-bit encrypted data can be shared throughout the organization, even over public networks. A crucial advantage of b² cryptography is the ability to reliably authenticate the true identity of a user over the network. As a security token is assigned to a user, a verifiable identity is associated between the token and user. Depending on the sensitivity of the data involved, authentication can be accomplished at any of three verification levels: standard, extended, and extreme verification. When extreme authentication is required, the system relies upon five-factor authentication which includes the GoldKey token, iris scan, facial scan, thumb print, and PIN. Applications include access to highly restricted areas, access to highly sensitive data, or weapons control systems. The CybrSec Secure Access modules installed at high-security entrances, can be set to require extreme verification before allowing access. 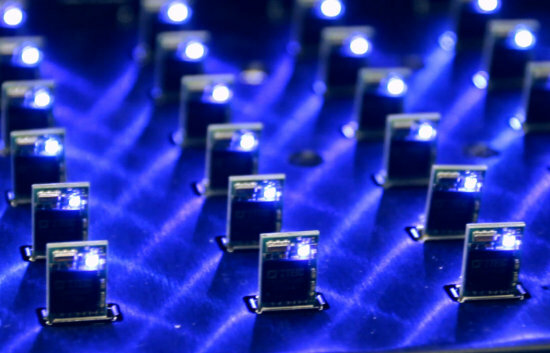 b² cryptography is built into fs‣ix® servers and WideBand® Nano-Latency Concentrators. Integration at this level provides wire speed end-to-end encryption for data transmission and secure, highly available, data storage — critical for military deployments and unachievable with other software-based security solutions. 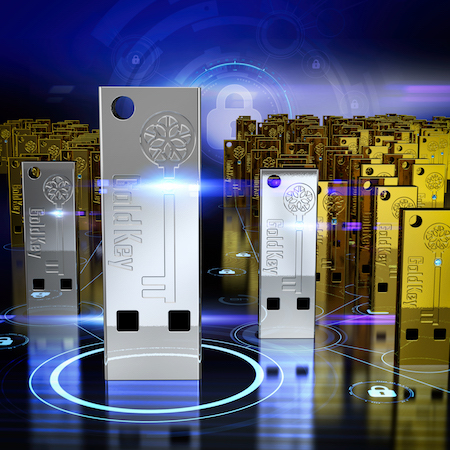 GoldKey® USB Security Tokens utilize b² cryptography to provide a hardware-based identity and access management system for trusted authentication of users for access to data, facilities, and secure communications. 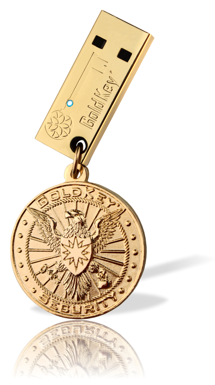 GoldKey Tokens are registered to Master tokens to control user access to all resources secured by GoldKey. For increased security the GoldKey hierarchical management system has been designed to put control into the hands of those in command, allowing them to easily delegate or revoke authority to users in the system without the need for IT involvement. 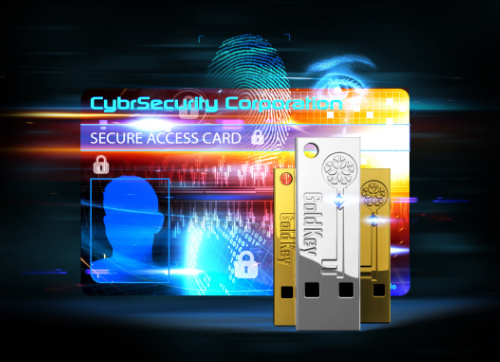 GoldKey Access Cards and Downloadable Tokens for mobile devices, utilize b² cryptography in an alternative form factor that offers seamless integration. To provide a robust and effective solution, the key exchange and access technology is only part of the overall system. For this reason, the world’s first, high security server has been developed by the fs‣ix® server division of GoldKey Corporation. The fs‣ix server is unique in the sense that the hardware-based symmetrical key management technology has been built into each server. 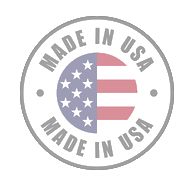 The servers themselves are state-of-the-art, high performance units with a built-in UPS to sustain operation during power outages. They also provide advanced data redundancy and backup capabilities to prevent data loss and to provide data availability even during network outages. These advanced features are managed by a Network Management Unit (NMU) which also utilizes hardware-based security to prevent tampering and outside threats. GoldKey also manufactures the GoldBook Pro, a ruggedized 12 inch, two-in-one computer that doubles as a laptop and as a tablet. 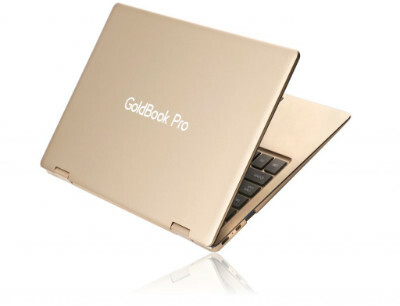 The GoldBook Pro utilizes the Windows 10 Pro operating system and comes with GoldKey security built in. 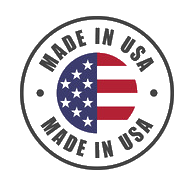 Protecting our warfighters is a mission we take seriously and extreme detail and care is utilized to make sure all our products meet the highest quality standards for security and reliability.